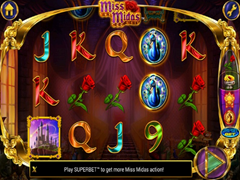 Miss Midas Pokie Review - Play Today! If you would like all your winning spins to turn to gold, NextGen Gaming created this video slot especially for you. Miss Midas brings her powers to turn everything she touches into gold all the way from the kingdom of Phrygia in Turkey. NextGen Gaming presents a fabulous game on 5 reels with 25 golden paylines ready to reward with the super bet function. The game features wilds, scatters, Miss Midas golden touch feature that turns roses, fruit and more to gold. The jackpot bonus round offers golden wins up 2 500 coins. Once Miss Midas sprinkles her magic, golden wins finds their way to your wallet. Rich colour mixes circled with gold is used to enhance the fabulous graphics, backed with a magical soundtrack. The transparency of the reels allows a view into the riches of the beautiful princess. The reels is presented on a golden platter to serve up top rewards. the symbols includes a peacock with features spread wide open to impress with striking colour mixes, highly decorated chair of green and gold with red velvet upholstery, golden bowl offering a variety of fruit such as bananas and grapes, red rose and the poker symbols is offered in different colours with a metal effect. The superbet feature is offered in the shape of an hourglass and the throne, rose, peacock and fruit turns to gold once the pink liquid touch of the princess reaches it. The game has a beautiful theme that will amaze players with the colours and quality. The game will amaze you even more with the features offered along with the other symbols. The first of these symbols is the wild, which players will find an all 5 reels to complete more combinations as the symbol can change into any other symbol on the reels. When the symbol appears players will find that Miss Midas can turn symbols around her into wilds as well. The game will allow a massive amount of winnings when this occurs as it is possible for all 3 centre reels to be turned wilds. These symbols replace all, but the scatters. The symbols holding the castle is also a special symbol and will represent a scatter. These are the only symbols that need no lines to complete combinations of their own and activate the free spin bonus game. Players will be able to win 15, 20 or even 25 free games. The feature will allow players to get the wild feature as well to increase the winnings even more. The free spin game can be reactivated, but will need players to get another 3 scatter symbols on the reels. NextGen created this game with astounding details, great sound and players will certainly have hours of fun playing this video slot. The bonus features are generous with rich rewards and the superbet offers profitable play as the symbols are turned to gold.